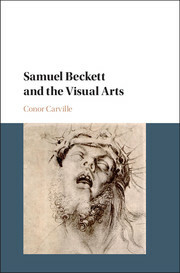 The magnificent collection of Samuel Beckett’s manuscripts, notebooks, letters and other material held here at Reading was fundamental to the research for my new book Samuel Beckett and the Visual Arts, which has just come out from Cambridge University Press. To take one example, I vividly remember, early on, calling up a tattered old jotter. Opening it I found neat lists of the pictures Beckett had looked at while living hand-to mouth in London in the early 1930s: paintings from the British Museum, the Wallace Collection, Hampton Court and Leeds Castle. There is no mention of contemporary art of the 1930s. It is the painting of the past in which he is interested: Hieronymus Bosch, Watteau, Dutch and Flemish artists of the 17th century. 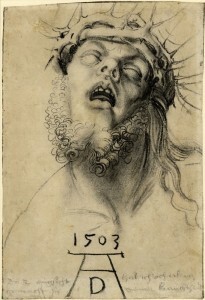 Some titles are marked with a small X, such as Dürer’s extraordinary drawing Head of the dead Christ. Dürer’s charcoal drawing from 1503 is small and intense, about 30 cm by 20 cm, though the head itself is half that size, as the bottom of the sheet is taken up with the artist’s monogram and an interesting handwritten comment, which Beckett carefully notes down, and to which I will return in a moment. Later, when I called the drawing up in the study room of the British Museum’s Department of Prints and Drawings, I was immediately struck by the centrality of the fleshy, gaping mouth. It seems almost an entity in itself, somehow separated from the rest of the image. Christ’s blank, closed, marmoreal eyes contrast with the fleshy parted lips: it is as if the mouth is caught mid-speech, continuing to talk even though the rest of the face has lapsed into rigor mortis. It was an extraordinary moment for me, and one that I only understood properly after my initial reaction passed. I realised I was reading Durer’s 500 year old drawing through one of Beckett’s own most powerful visual images. In his 1972 play Not I, the manuscripts for which are also held in Reading, Beckett focuses on a single disembodied mouth, suspended in a spotlight on a blacked-out stage, issuing streams of fragmented sentences. ‘Into this world’ is the first line of the play, suggesting the sense of an entity that has been pitched into a realm of suffering from some other sphere, as Christ was.